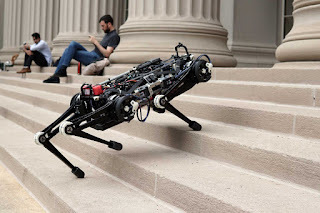 It's called Cheetah 3 and it's a standout robot developed by researchers at MIT. Three key differentiators: it's blind, fast and extremely dexterous. It can climb stairs, jump on to a desk, move around 360 and shove. All thanks to new algorithms the MIT team developed. It's designed to do many things humans can't in a challenging environment. There's a key reason for the robot's "blindness". Researchers want the robot to rely more on tactile information. That way it can handle unexpected obstacles while moving fast. Researchers say if the robot relies mostly on vision to make decisions, its speed slows down. It's a robotic cheetah designed to move with great speed and agility. Cheetah 3's physical agility is amazing robotics. MIT videos show it quickly climbing up stairs, shoving objects, slow trotting and jumping up on a desk. It has all the moves of a real cheetah. MIT researchers designed Cheetah 3 to do work that's impossible for humans to do. In October they'll present the robot's vision-free capabilities at the International Conference on Intelligent Robots in Madrid.